The Florsheim Imperial Kenmoor 93605 is the most sought after vintage Florsheim shoe on eBay. 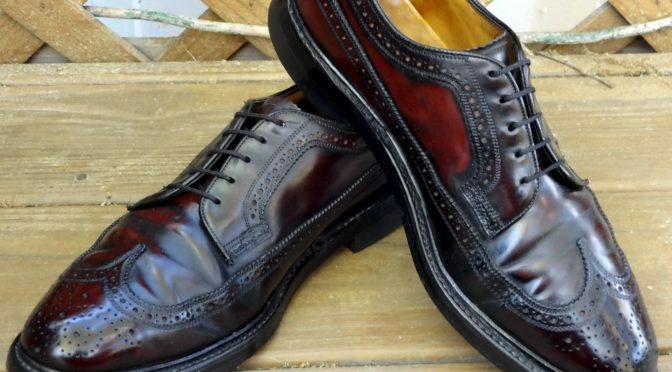 The Imperial was one of the best American made shoes in its day and this model’s Shell Cordovan leather was a step up from the more common calfskin Imperials. The shoe has the classic “gunboat” long wing style that was very popular in the USA during the 1960s and 1970s and remains somewhat popular today. It’s goodyear welted double leather sole and armored heel means its a very durable shoe. 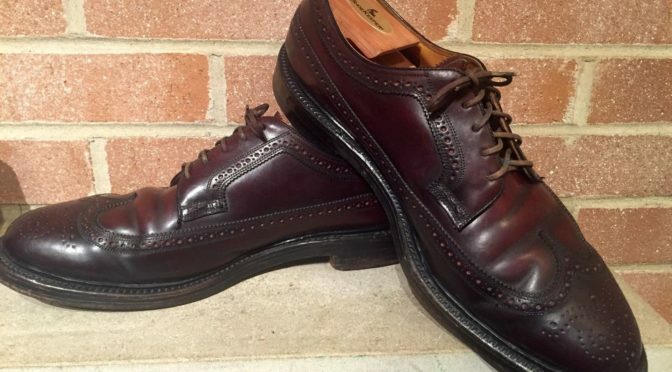 The 93605 is also a good value for someone looking to buy a Horween burgundy Shell Cordovan long wing. 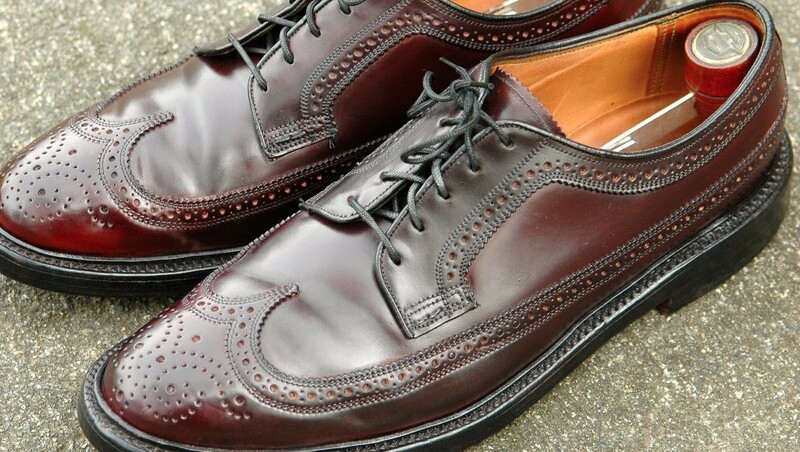 While not cheap, they are more affordable than paying $740 for a new Alden 975 or $650 for an Allen Edmonds MacNeil. 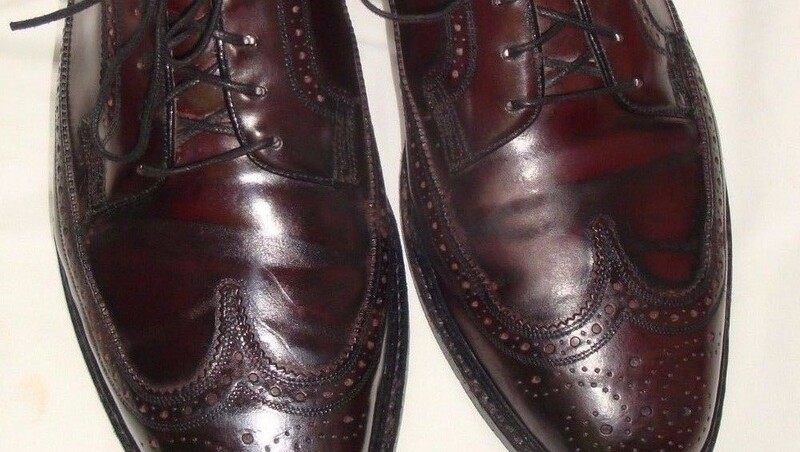 There are other options for used Shell Cordovan long wings on eBay. A used Alden 975 is fairly common but will regularly sell on eBay for $450 (the #AldenArmy is strong). 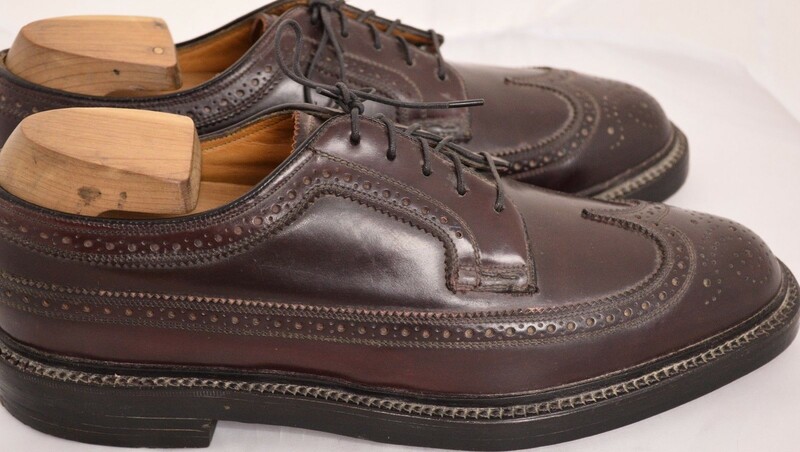 Used Allen Edmonds MacNeil shoes (models 9187/9097), are also common and have a similar price point as worn Florsheim 93605 shoes. 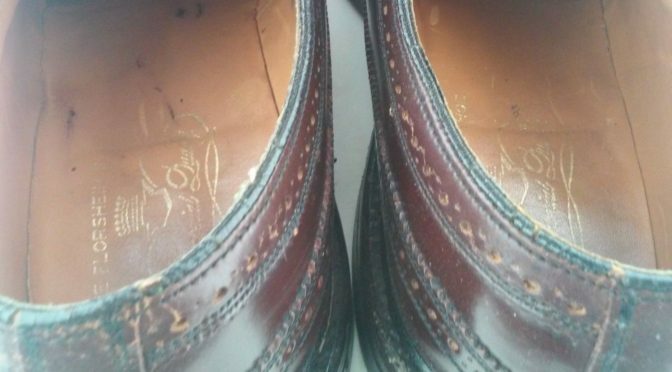 Hanover LB Sheppard Shell Cordovan shoes are infrequent but not rare. Nunn Bush, Bostonian, Johnston and Murphy, Nettleton and French Shriner all made Shell Cordovan long wings but they are very rare so good luck finding one. I have bought and sold a lot of pairs of Florsheim Shell Cordovan 93605 shoes. I definitely don’t need another pair (or do I? 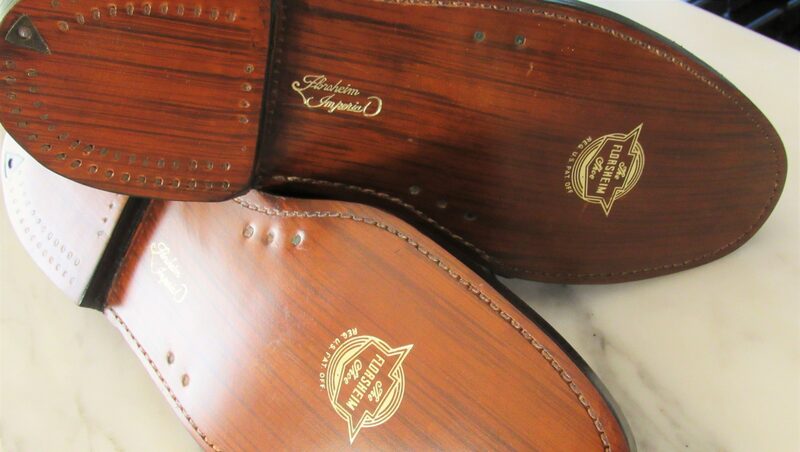 ), but I thought I would pass along some of my experience to others looking to buy or sell a vintage pair. 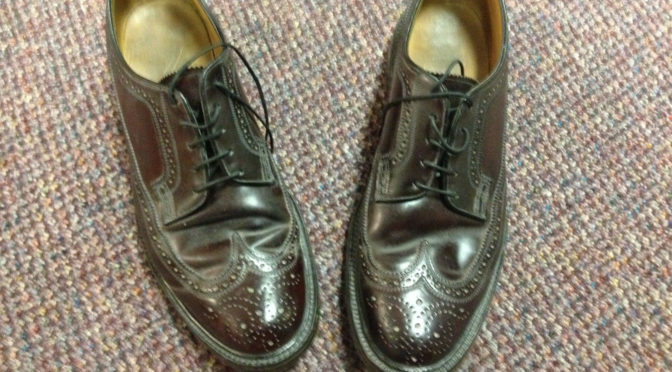 The Florsheim Imperial 93605 was made from about 1957 to 1988. It was preceded by a similar model called the S-1724 Viking. 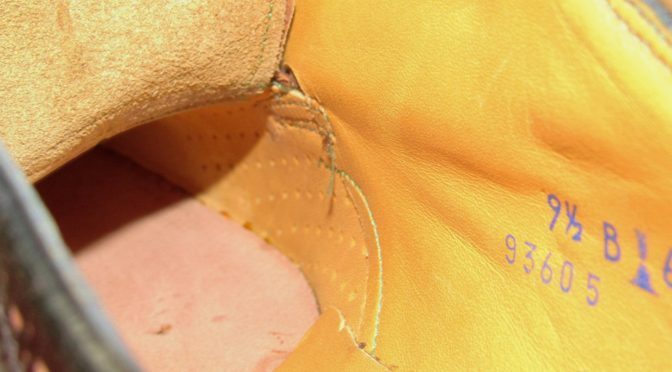 Outside of the heel change in 1973 (v-cleat no longer flush with the edge of the heel), the model materials and design largely stayed the same over the years. Pre-1973 examples are fairly rare though. This was one of Florsheim Shoe Co’s premium models and was an all leather shoe with full glove leather lining. It featured a double leather sole accented by 5 nails and a leather heel with v-cleat and 50 to 80 nails. The heel is essentially a steel heel held together by leather. This limits traction and is why some call it a “suicide heel” due to wearers slipping and falling on smooth surfaces. If you find a pair with a rubber heel, the heel was replaced at some point (and probably by someone who fell). The Florsheim 93605 was eventually replaced by the almost identical Royal Imperial 97626 in the 1990s. Below is a 1961 ad for the 93605. Shell Cordovan long wing Imperials came in two colors: brown (93605); black (92612). For the Florsheim Imperial 93605, the color of the leather can vary from a darkish eggplant (see photo below), to almost a Coca-Cola cherry red. For a single pair of Florsheim shoes, both shoes will have the same consistent color. From what I know of the manufacturing process, each shoe was made from a single “shell” and Florsheim did a very good job matching the shells so the left and right shoe look the same. The shell color on other manufacturer shoes is sometimes not as consistent. 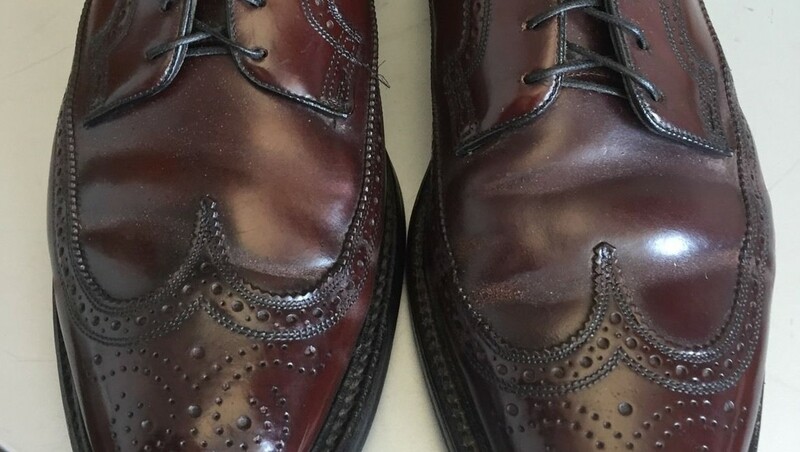 I have a pair of Johnston & Murphy shell shortwings and a few pieces of leather on the shoes have a somewhat different color than the other pieces. I believe this is due to the use of multiple shells for a single shoe. 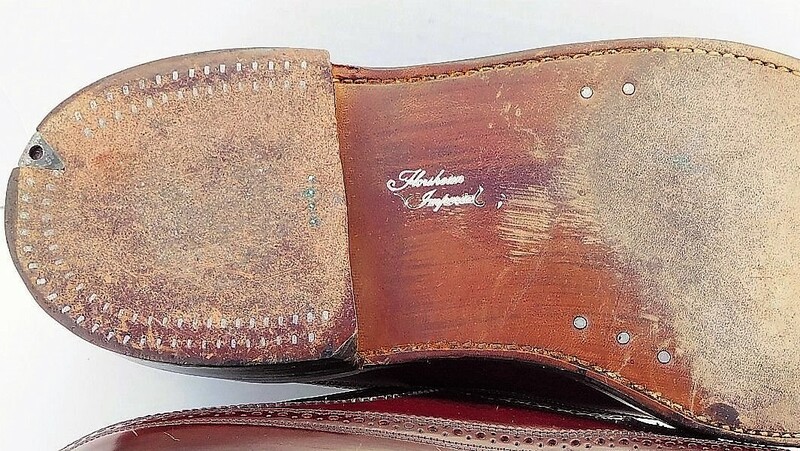 According to this Ashland Leather post, Florsheim used Horween color #4 for this model. In my experience, the Florsheim 93605 runs true to size but I have found less size consistency in 1960s models. 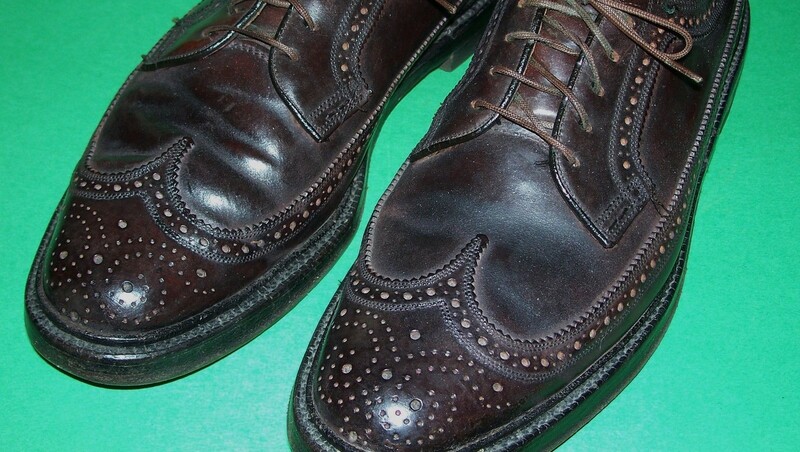 Compared to a similar size AE MacNeil, the Florsheim will have a bit more room in the toe box. 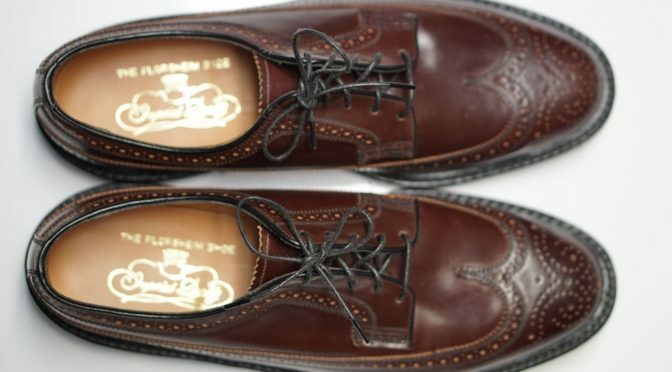 The Alden will be a half size off because of the Barrie last. 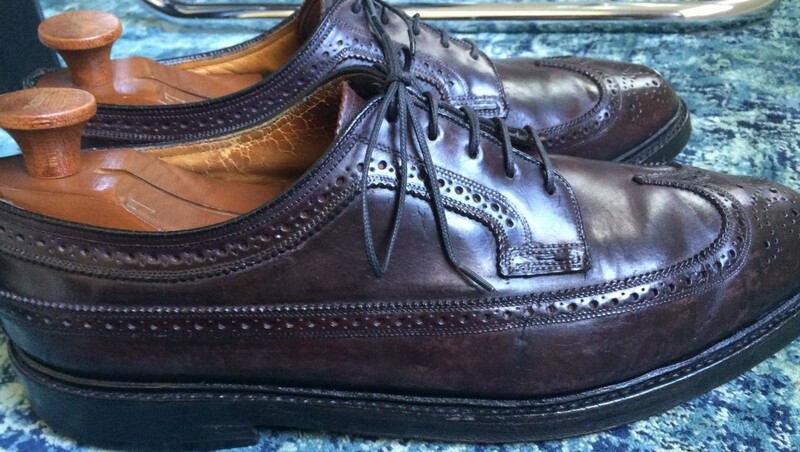 11C and 10.5D are the most common sizes for the Florsheim 93605 on eBay. These charts breakdown eBay listed 93605 sizes and widths during the past year. The size of vintage shoes can be hit or miss. If the shoes don’t fit or you find your feet hurting at the end of the day, don’t wear the shoes. You can usually resell the shoes for a similar price to what you paid for them. Most eBay sellers are not the ones who wore the shoes. They bought them at estate sales, goodwill etc. Most don’t know how they fit. This is their job: Phase 1) Buy; Phase 2) Sell; Phase 3) Profit. 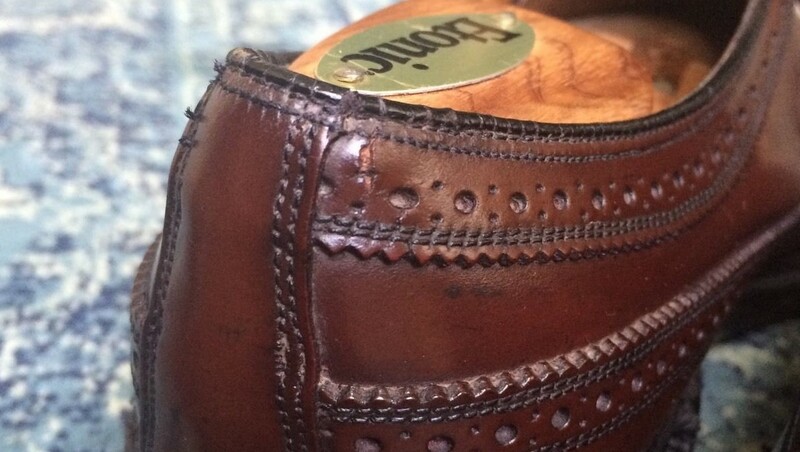 When buying used Shell Cordovan, watch for damage in the heel counter or tears near the eyelets. Once the Shell rips or tears, it can’t be fixed. Some damage will likely lead to more damage, so I avoid shoes with even minor deterioration. Another issue is over waxing which can be difficult to remove. 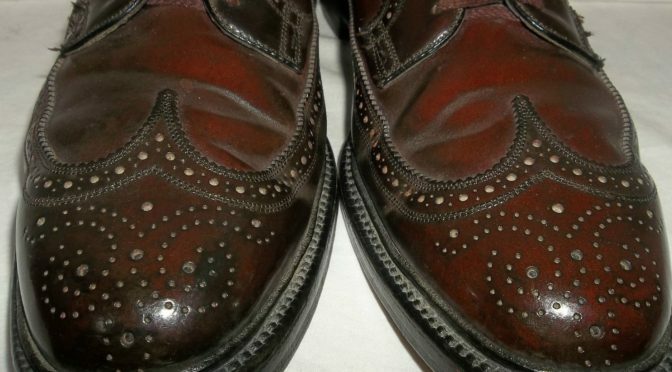 If the broguing looks like it has burnt orange highlights, then minimal or no wax/polish has been applied to the shoes. The lack of wax/polish also means the shoes have likely received minimal conditioning. If the listing photos are poor, old shell is a bit of a gamble so prepare to be disappointed. After buying a pair, they will likely need some reconditioning. I usually start with wiping the pair down with a damp cloth and then giving them a vigorous brushing. You will usually see a huge improvement from just doing that. Then, depending on the condition, I will use Saphir Reno Mat to clean them. If the shell is very old and dry, I give them an application of Lexol NF Neatsfoot and then Bickmore 4 for conditioning. 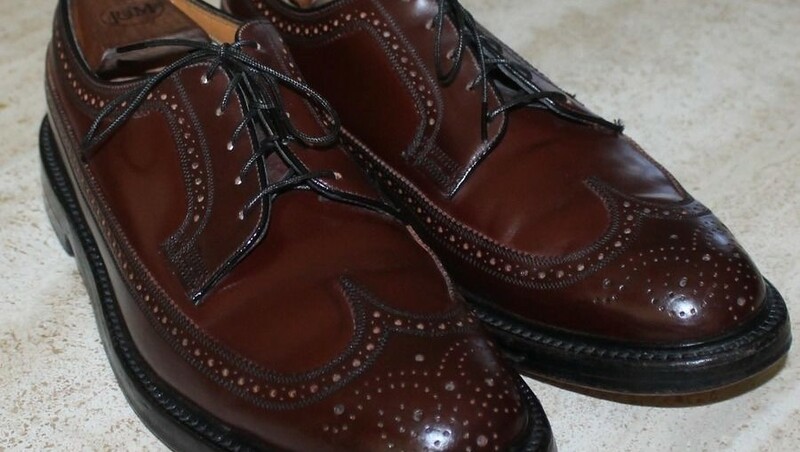 For regular maintenance, I use Venetian Shoe Cream or Saphir Renovateur which will both condition and shine them. 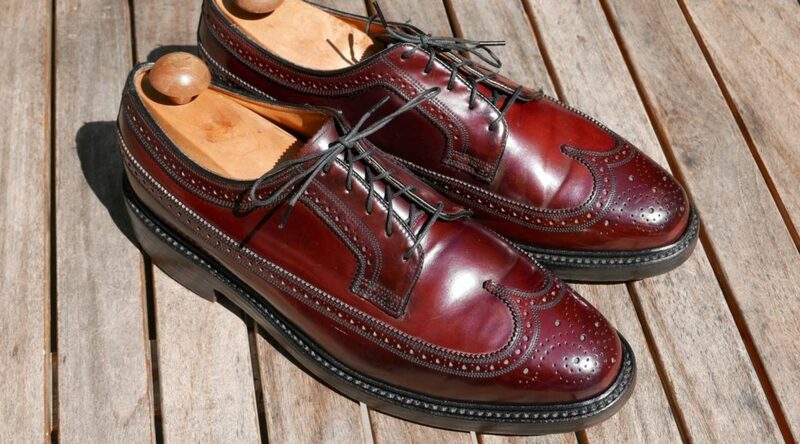 I typically don’t use hard waxes on Shell Cordovan but I have used Allen Edmonds Cordovan Cream when there are dull areas. Collonil 1909 Supreme Creme is a high shine product that I have used. Disinfect the interior of the shoes. You never know. I use an alcohol spray but there are many commercial disinfectant products. 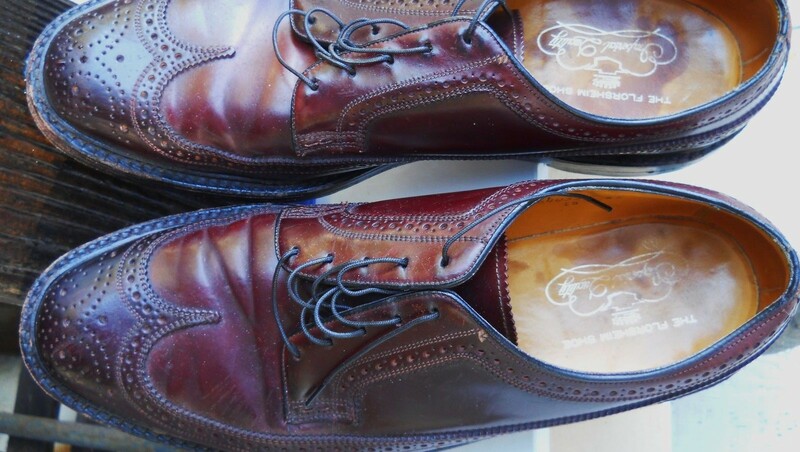 Below is a rough pricing guide for Florsheim Imperial 93605. The estimated price is based on actual eBay auctions and is in USD. Buy It Now prices were not considered. While the price is meant as a guide for buyers and sellers, an auction determines the actual market price. The more popular sizes (8.5 to 12 D) will have, in general, more bids. There is significantly more demand for wide sizes than narrow. The quality of the photos and preparation of the shoes will also have a large influence on price. 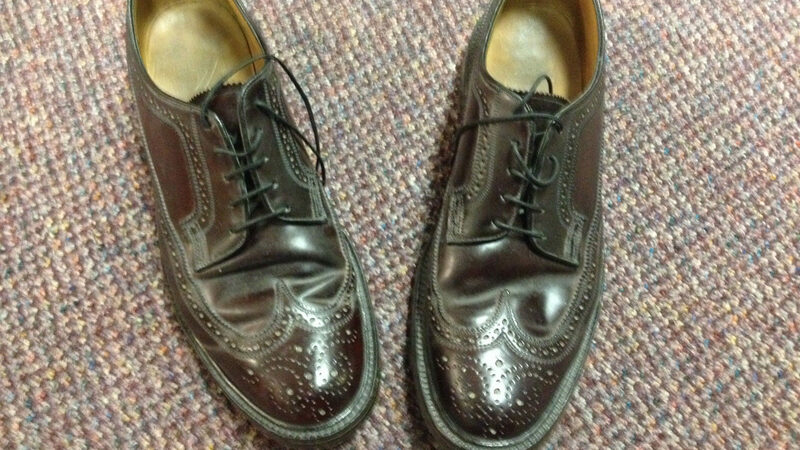 The following photos are of the same shoe in two different listings. The first listing sold for $40 and the second listing of the same shoe went for $180. I went through recent Florsheim 93605 listings and below are a few examples of the good and bad that I found. Dirty but in near new condition. Buy! Like new. Great condition. Buy them! Thank you so much for sharing this advice! I’ve been following your blog for a some time now and I am impressed by it. So to be clear, the Royal Imperial is not a better version than the Imperial, it just replaced it? Yes. The 97626 and 93605 are basically the same shoe. The heel is slightly different. The 97626 was manufactured once the 93605 ended. 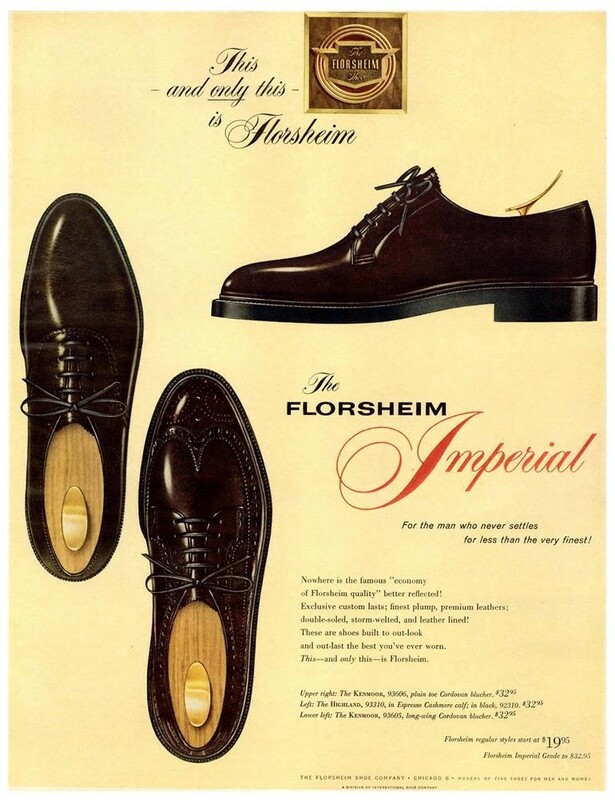 In the late 90s, Florsheim removed “Royal” from the 97626 and it became an Imperial. Very much liking your guide and article on Shells, I own the shoes you have mentioned in the NWOB Florsheim Shell, they are 12B size. Its a gorgeous pair with amazing shell variations. Thoroughly impressed with your blog and site..
Really, really love your work on this. I have a pair of circa 1966 93605’s that I’ve had resoled. 75 bucks for the shoe + much more for the resoling. The one problem is that there is a dark discoloration in the folds on the vamp. The rest appears to have developed a great patina, but the dark folds bugs me – any suggestions to improve this? Reno-mat? Reno’Mat is the best cleaner I have found for Shell Cordovan. It will remove old polish and that should help. Shell will darken in the fold areas. You can’t totally remove those. I just fixed up a pair of shell PTBs with a similar state. I posted some pictures on styleforum. I will update this blog with those photos soon. Thanks a ton, David. Love these things, with the exception of those darkened areas in the rolls on the vamp. Just took a gamble on a pair of Hanover PTB’s via ebay – we’ll see how they come out, but at 30 bucks, not much of a gamble. Not listed as shell, but with reasonable indications that they were. David, thanks for the excellent resource. I just picked up a pair of worn – good condition 93605 from Goodwill. The liner in one shoe is light orange and in the other, the liner is light tan. Is this considered a significant defect or is this just what happened some times due to supply variation and it’s ‘acceptable’? I may try to find a good home for this pair since it’s a size 9d and it’s a bit more snug than I like, but I had to buy it because it was so handsome. Its hard to say without seeing a photo. You can send me an email through the contact form and I will reply. In the 90’s I used to work at shop that carries Alden. We had couple Alden Shell #8 color on the window (part of the display) that gets afternoon sun. After several months, the inside lining becomes fade to the light tan. It is possible that your shoe might have been in the store display facing sun for a while. Thank you so very much for educating us. I am in the market for a vintage pair of several models. I have spend 3 hours looking. Time well spend! Great article and very informative, as I’m looking for a pair of vintage cordovan shoes, I have purchased a number of vintage cheaney and Barker Calf skin shoes in the past but now want to try get some cordovans,all my purchases have been from eBay and most have been good as the photos, one pair had dried out and the sole split open but I got it fixed and they look fantastic. How do I recognize over-waxing, and why is it bad? 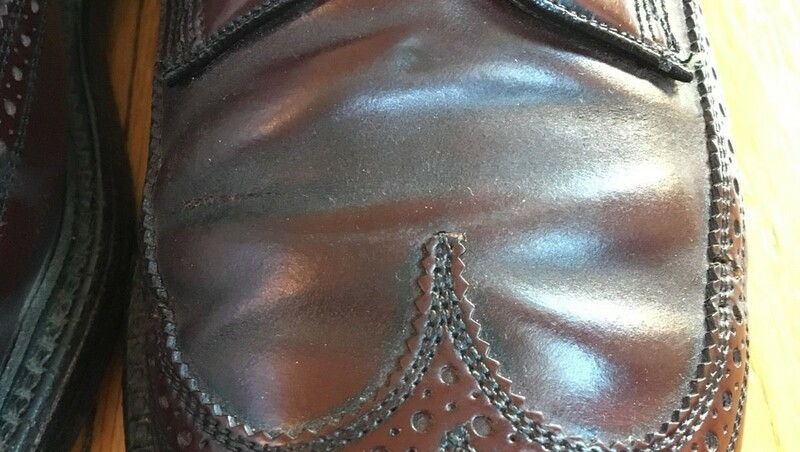 The old wax can develop a gritty feel and discolor the folds of the leather. You’ll see dark bands in the shell. Its tough/impossible to remove. Thank you for the inline hint! 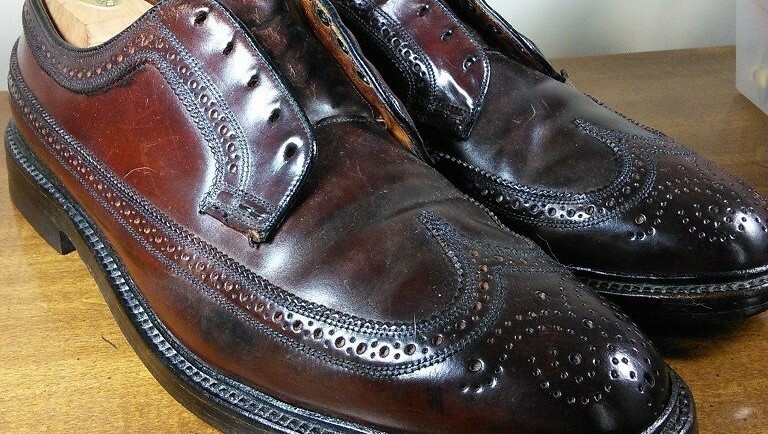 Yesterday I got a pair of Cordovan Imperials from a honest eBay-seller, the pair looked first quite ok. But when squeezing the part above the heel, I realized a light crackling along the vertical seam, also when squeezing the leather on the body of the shoe, a crackling exactly lengthwise in the brogueing showed up. This hasn’t been visible on the photos. When I informed the seller (not an experienced shoe seller), he was obviously more shocked then I was, he offered immediate refund and the shoes for free, as return postage from Switzerland would have been very expensive, no doubt a second buyer would have complained too. So this bad purchase had been an excellent human experience! Now I have a pair of Vcleat Florsheim cordovan I can use for cleaning tests etc. How does such damage happen? Is it from not using cream and pomade? From not wearing such shoes for decades? From not creaming and not wearing? From moisture? 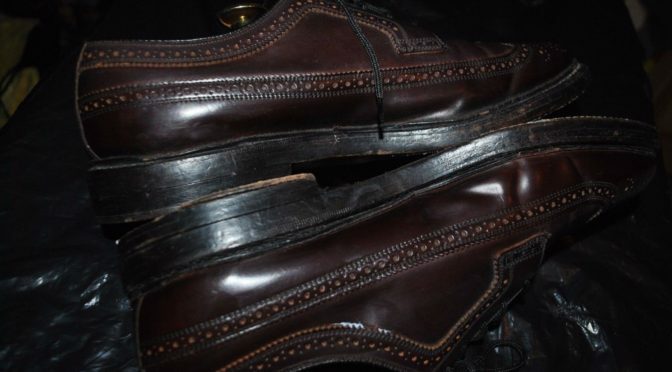 How is it possible to keep an old shoe (30, 40, 50 years old) in good condition and to wear it? Is there a way to secure a shoe that one finds in an estate and that hasn’t been worn nor creamed for decades ? Sorry for my English mistakes, I am not English spoken! Every pair is different but you are likely correct about the cause – lack of conditioning. 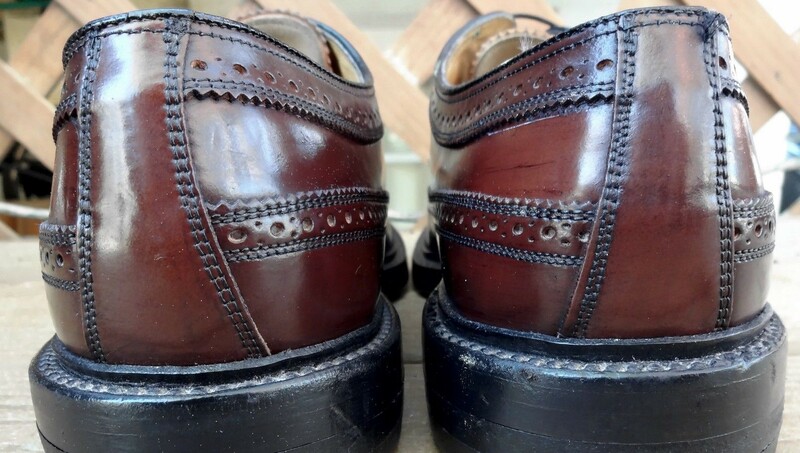 If you buy vintage shoes, its likely impossible to know their full history so prepare to be disappointed. Unworn shoes mean that the shoes likely haven’t been conditioned as well. While polish is not something you want to do regularly to shell, when it is needed any thoughts on color for say spahir cordovan cream….dark brown or cordovan? I use cordovan color creams. Just use a little bit. Do multiple coats if necessary. I also use neutral Venetian Shoe Cream and Collonil 1909 supreme cream. I like to buy shoes with the original soles and heals intact because that gives me a true indication of where the shoes are in their service life. Any signs of cracking should immediately disqualify shoes from purchase. If pictures are unclear , always assume the worst. If the uppers are solid and the insoles are clean and unfrayed, I will re-sole and re-heel with a combo heel. Because my feet are different than the previous owner’s, I always use a shoe repairer that strips the old and does a hot re-cork when re-soling. 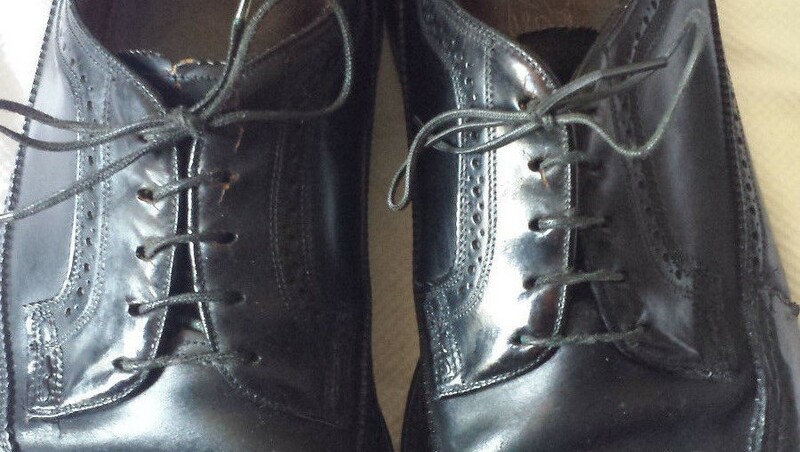 When complete, the shoes look and feel practically new at a tiny fraction of what they’d cost today. My father wore Florshiem’s back in the day and I swore I’d never… boy times have changed. Excellent; I was shopping for Kenmoors when I saw this and found some wonderful deals in a hard to size shoe (6.5 D). Great advice. Really loving this website (although it’s not doing me any favours in buying yet more ‘expensive to import’ shoes 🙂 ). 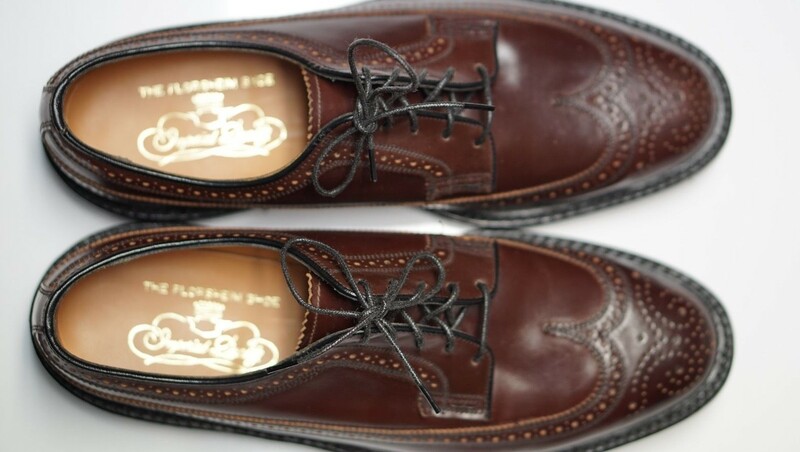 I’ve been long wanting to get some Alden 990s to go with my 975s but have recently become enamoured with Florshiem 93606s and am thinking they’re the better move rather than a brand new pair of 990s. 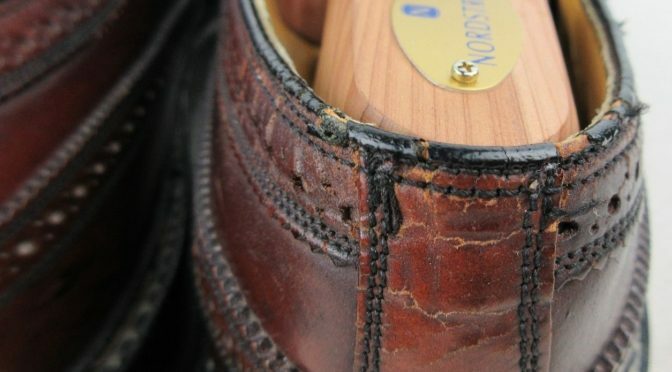 Can I ask about heel damage as I’m slightly unsure… I find that the topmost tiny 2mm ‘liner’ part of the shoe that goes round the whole area you foot goes into – here it’s often cracked or frayed at the heel. Is this a problem or are we really talking about heels that have been badly treated as the foot goes in the shoe and it’s compromised the integrity of the counter? I appreciate there’s may not be a perfect answer here but I’m wary of discounting an otherwise decent shoe. It seems hard to get a perfect ‘liner’ (I’m sure there’s a better word for it). Its tough to assess damage unless I see it. You can send me an email with photos. My email address is on the contact page. Sorry, I lost track of this page and didn’t appreciate you’d replied… Appreciate the offer of checking out the photos and may take you up on that in future… I went ahead with the 93606s and, scratch aside, they’re very good condition after my amateur restoration (following your instructions). Cool. Its an easy fix. Have you found that pre-1973 models command higher prices? I like the style of the flush v-cleat on the heel a bit more than the indented. 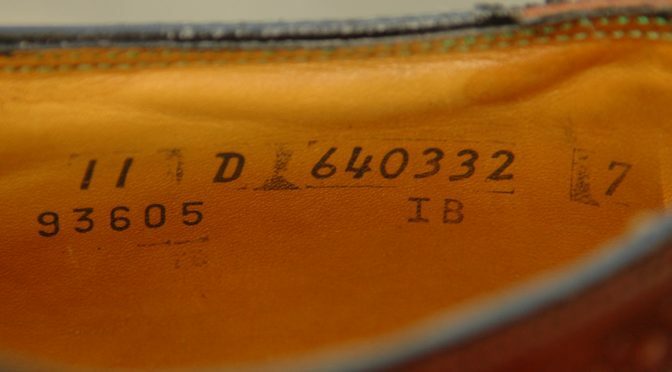 No idea if that’s something that can be recreated with a resole or not, but curious if I can expect to pay more. Generally the 60s versions command a higher price but they are also really rare. The 60s construction is somewhat better than the 80s. 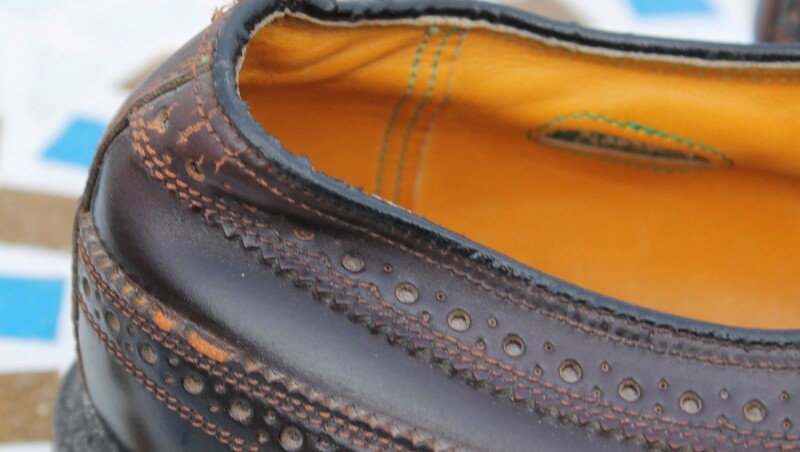 Since 60s pairs are so old, you need to be more concerned with dry/cracked shell. 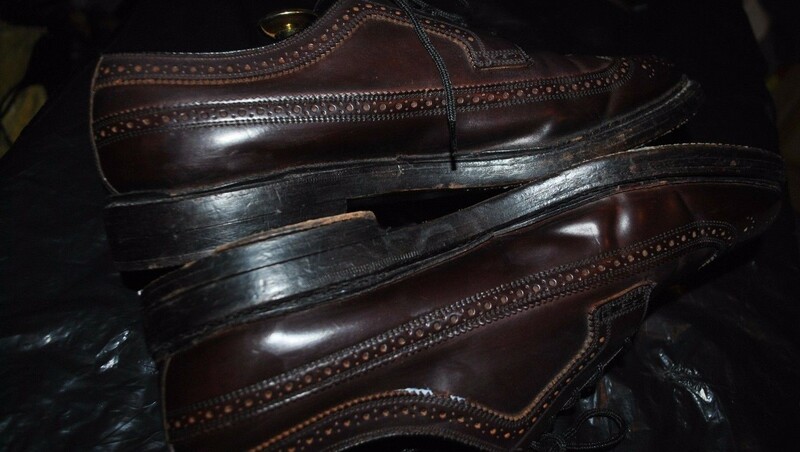 I HAVE A ROYAL IMPERIAL SHOES ITS SEEMS TO ME HAVE NO DIFFERECE BECAUSE THE QUALITY IS THE SAME, MAY BE IM WRONG. I USE ALL KIND OF STYLES AND I LOVE THIS FS BRANDS.